So, I've been a little distracted recently. Partly because I've been working on something that I've been wanting to do for ages. I wasn't going to say anything about it quite yet, I don't want to tempt fate, but I'm really rubbish at keeping secrets. OK, if you insist I'll tell you. Next week I hope to have a little (teeny tiny little) zine for sale. It includes a few of my favourite drawings from my Moleskines. They seemed to be some of your Faves, too. This drawing is, in a way, a promotional piece for the zine. All of the things in this illo are clues to the drawings that will appear in the zine (does that make ANY sense?). Maybe you can spot some of them amongst THIS LOT. Or, just come back in a few days time to see some photos of my very first zine. If, of course, I haven't jinxed it, by letting the cat out of the bag, before it's actually been printed. Yikes. WHY did you make me tell you? Andrea, it must be fate that brought me to my computer tonight to write to you. It has been way TOO long since I've been in touch and I wanted to see what you've been up to. I can see that you've been producing wonderful new work (that's no surprise). I am so excited to hear about your zine! recently I've been toying with a top secret project of my own and after reading your post (great drawing by the way), I know that I must follow through with my idea. Will it be available through your Etsy store? I want a signed copy! Take care and talk to you soon. i'm so happy to see, that you are working on something you wanted do for so long. congrats andrea, I'm happy for you. excellent drawing....ur pen work is amazing...very smooth! I have to do a presentation today at a local school - art class. I'm giving them your addy! Your work is incredible, Andrea. Ooooo! Can't wait to see it. Your work is so wonderful and inspirational. I want one too! Wow. Congratulations. I guess it will eb wonderful to hold your own zine in your hand. Will you sell it in your Etsy store? Can it be pre-ordered? Great news - I look forward to seeing it. Wowwww, you drawing my Ipod!!! Ve haf vays of making yu talk. ;) Love the composition of this one. How EXCITING! And what a great drawing. I really love it when you add colour to your biro drawings. Looking forward to the zine! Great idea, nice that you're working on something you wanted to do for ages... and I want one, too!! Love your work, you are very talented! Great drawing and great news! So glad you can't keep a secret. Wonderful drawing! The composition is awesome, and the light beautiful. Love it when you use different colors! I can't wait to see my little zines. And, keep posted to find out how you could win this drawing. Salvador, it has been way too long. Yes, it will be available on Etsy. Hopefully in about a week. G, you helped me do it. Sue, wait til you see the title of the zine! The drawing is lovely considering the elements you drew. I love making zines, although I have never had one "printed." I usually just make all originals when I do a swap. Looking forward to seeing yours! Your artwork is amazing. 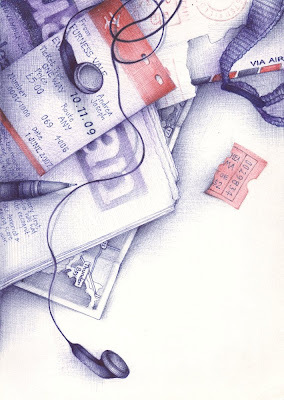 I just love it and cannot believe it is done in ballpoint pen. It is so soft and wonderful. You are an inspiration. I can hardly wait to get your zine! It will be a treasure. Oooh, looking forward to this! I would love to buy one! Have been quietly following your blog for a while now. You are very inspiring and SO talented! Thanks for sharing your work and thoughts! I am new to your site and really love it. You are quite funny and really good at drawing. Nice job. Fantastic work! Good luck with your zine. I love your work, I want one too. How to pre-order? Well, I certainly hope it has all the shoe drawings!! That is great news. I most definitely want one. Hey Andrea. I really like your sketches.... The're amazing. Cool blog you got here. I'd like to read something more about this matter. Ah, it must be fate because I was lucky enough to buy a few of your zines already! Even from the photos the quality looks incredible. What an awesome idea! Very well done! Great opinion you public here. It would be great to find anything more concerning this topic.